STEVE SKROVAN: “That’s correct. And, if recent activity in our Facebook page is any indication, this is a very anticipated show in what we hope will be a series of interviews with national candidates before Election Day. We have sent invitations to all of the presidential candidates, who have made it on enough state ballots to have a mathematical chance to win the United States Presidency. That includes, of course, Hillary Clinton and Donald Trump and Libertarian Party candidate Gary Johnson. “The first to accept our offer to engage with Ralph is Green Party presidential candidate Jill Stein. Dr. Stein is a physician, who graduated from Harvard Medical School and practiced internal medicine for 25 years in Massachusetts. “In the 1990s, Dr. Stein became increasingly concerned about the links between illness and environmental toxins, especially exposures to lead and mercury and dioxin contamination, that comes from the burning of waste. She helped lead the fight to clean up coal plants in Massachusetts, then known as the Filthy Five. This ended up setting an example for how other states could raise the standards for their own coal plants. “Her first foray into electoral politics was in 2002, when she was recruited by Green-Rainbow Party activists to run for governor of Massachusetts against Mitt Romney. She’s the co-author of two significantly praised reports, ‘In Harm’s Way: Toxic Threats to Child Develpment’ and ‘Environmental Threats to Healthy Aging’. She was the Green Party president in 2012 and, again, here, in 2016. DR. JILL STEIN: “I believe it’s Oklahoma and South Dakota. And we’re on as a write-in [option] in North Dakota, in Georgia, and Indiana. DR. RALPH NADER: “Right. Well, you’re on the ballot for the states where our listeners are, overwhelmingly. Let’s get to the next point, which is your platform, as I read it. And I’m gonna summarise it. Either, it has majoritarian support in this country or very close to majoritarian support. “For example, you want a public works program dealing with public transit, sustainable agriculture conservation, renewable energy. I think most people would like that, That probably comes in about 90%. They see their public works crumbling, services inadequate, they have libraries and schools and bridges and highways that have not been repaired. “Full Medicare-For-All, free choice of doctor and hospital. That comes in 60- to 70% without even further explanation. And, if you ever explained it, given all the trouble people are having qualifying and not qualifying for all these healthcare, so-called, insurance plans, it would go up even higher. “You want to do something about student debt. And that affects conservative and liberal students. That’s going to be a majoritarian position. “You want a global treaty to halt climate change, that adds teeth and ends destructive energy extraction. “Ending police brutality and mass incarceration. There’s a growing left-right support for criminal justice reform. “I suppose the Green Party doesn’t care for the anti-civil libertarian provisions of the notoriously named P.A.T.R.I.O.T. Act, invading privacy, and being able to search your home, and not tell you for 72 hours. I think most Americans are against illegal surveillance of their emails and telephone calls by the government. “And I think most Americans are ready for waging peace and not just brutalising our foreign policy, which is boomeranging against us. “So, here we start out, Dr. Stein, with a majoritarian platform. We live in a two-party tyranny, that doesn’t believe in competition, can enforce it with penalties and obstructions. And they’re getting closer and closer to being, both, one corporate party with two heads having different labels. DR. JILL STEIN: “Absolutely. You know, I think we’re at a really unique moment right now because the American people are waking up to the fact that it is a race to the bottom between these two corporate parties, that are sending jobs overseas, putting downward pressure on wages, starving people out of healthcare, locking an entire generation into unpayable predatory student loan debt. “So, you know, we’re at a point now where we don’t have to convince people how screwed they are. In my experience, what I’m hearing from people, now, is that they are just desperate to hear about something else. The two majority candidates right now, the Democratic and Republican candidates, Trump and Clinton, are the most disliked and untrusted presidential candidates in our history with more than majority disapproval. At the same time, you have 76% of voters saying they want to open up the debates. They want to be able to hear about something else. “You know, it’s rather remarkable. Donald Trump has had over $4 billion dollars of free prime-time media. Hillary’s had over $2 billion worth. My campaign has had, essentially, zip. Yet, we are still pushing up around 5% in the polls, which is unprecedented for a non-corporate party without the big money to get the word out. We’re getting out there simply by word of mouth, by networking among desperate people. The largest bloc of voters, now, has divorced the Democratic and Republican parties, which are now minority parties and the plurality of voters, now, are independent. They’re looking for something else. DR. JILL STEIN: My campaign filed the bill [on ranked-choice voting] back in 2002 in the Democratic legislature, 85% Democratic—they could have prevented any possibility of a split vote. [The Democrats] could have preempted any possibility of bypassing ranked-choice voting. They refused. The fact that they refused is very revealing. It tells you they rely on intimidation and fear in order to gain your vote. And the fact that they rely on fear tells you they are not your friend and do not deserve your vote!. “So, for me, that was like the lights went on. You know? That was like the moment of revelation for me that, in fact, we are not the lunatic fringe. We really are, we represent, the core of basic American community values. And the name of the game is getting the word out. You know? And they are quaking in their boots, which, of course, is why they will not pass ranked-choice voting. DR. JILL STEIN: “Okay. You go into the voting booth. And you can rank your choices. So, if your first choice is an underdog, that might not win, you know that your choice number two, which might be your lesser evil, your safety choice, your vote is automatically reassigned from your first choice to your second choice if your first choice loses and there’s not a majority winner. DR. RALPH NADER: “It’s worse than that. Worse than relying on fear is they’re excluding you from the seat at the table. One of the ways they exclude you is what you just said: Instant-runoff voting. “They always talk about spoilers, a political bigoted word, that should be called that. It’s only aimed at third-party candidates, never any others with the major parties. And they got an opportunity to deal with that with instant-runoff voting. And they don’t. “Let’s run through the various ways they’re trying to marginalise the Green Party, and even the Libertarian Party. One way is to keep you off the mass media. In 2004, Professor Stephen Farnsworth put out a report saying that I got about five minutes on all the networks after Labor Day to election day, only five minutes, even though I, like you, were representing majoritarian issues. Okay? DR. RALPH NADER: “Right. And these networks are using public properties, the public airwaves. DR. JILL STEIN: “None of the major shows. DR. RALPH NADER: “Well, that’s more than I got [as presidential candidate]. “Alright, the third way they block competition and continue the two-party duopoly is with the phony name called the Commission on Presidential Debates, which is a nonprofit corporation created by the Republican and Democratic parties, as you know, in 1987 to get rid of the League of Women Voters’ supervision of debates. And it is funded by corporations. The debates are greased by companies like Ford Motor Company, AT&T, Anheuser-Busch. And, except for letting Ross Perot on in 1992, they haven’t let anybody on. And they get the cooperation of these networks, who make money from the ratings, to keep everybody off. DR. RALPH NADER: “So, there you are. What’s happening is that the will of the people, the declared opinion of the people, who want more agendas, more ideas, more sensible re-directions for reforms in our country, are being thwarted by the mechanism of keeping third-party candidates, who are on more than enough States, theoretically, to get an electoral vote majority, to keep them off the mass media, the commercial media, to keep them off the debates. “Now, unless you have billions of dollars, it’s impossible to reach tens of millions of the American people, no matter how hard you campaign. And you’ve been campaigning non-stop, Jill Stein. “So, if you’re kept off the debates, you can’t reach more than 2% of the people, even if you campaign every state and fill the big conventions like Madison Square Garden. DR. JILL STEIN: “Yes. We had good coverage. And, you know, let me just add to what you said about the Commission, that fake Commission, a very public and official sounding name. DR. RALPH NADER: “Let’s get back to the debates. The first debate, which you are excluded from, Dr. Jill Stein—and Gary Johnson as well—is September 26. It’s coming up fast, at Hofstra College in Long Island. And, then, they have two more debates, at the presidential level, and one at the vice presidential level. “I wonder why they’re rationing debates. You want to talk about people wanting more debates at this stage of the election. It’s probably 95%. DR. JILL STEIN: “Yes, I’m going there. We now have over 100,000 people who are signed up on our campaign and our petition to open up the debate. And we’re encouraging people to come and to join us and to insist that we need to be included. “So, exactly what the plans are at Hofstra, we will be advising people as the time gets closer. But we are not just going to go quietly into this dark night. “In this election, we are not just deciding what kind of a world we will be, but, arguably, whether we will have a world or not going forward. If my campaign is not in the debates, we will not have a real discussion of the emergency of climate change and why, in fact, we need a Green New Deal type national mobilisation at the scale of a wartime mobilisation in order to address this emergency. “If my campaign is not in the debates, we will not be talking about how we really fix this problem of endless and expanding war, why we need to cut the military budget by 50%, why we need to bring back our troops scattered overseas—the police force of the world—in over a hundred countries, something like eight hundred bases—but who’s counting?—why we need to, basically, bring those troops home, and why we need to stop this policy of regime change, these wars on terror, which only create more terror. This needs to be debated. DR. RALPH NADER: “That’s true because, both, Trump and Hillary want bigger military budgets. And Hillary supports President Obama’s $1 trillion dollar expenditure to, so-called, upgrade nuclear weapons. “In the meantime, the big corporations are fleeing America for tax havens in places like Ireland and Luxembourg and the Grand Cayman Islands; the rich are finding more tax loopholes to expect; so, when are the people going to, basically, roll up their sleeves and say? We’ve had enough. We’re going to recapture Congress. “As you know, Jill, a lot of progressives, they have great agendas and they have great solutions, but they don’t pay enough attention to recapturing Congress. And recapturing Congress—535 men and women, who put their shoes on every day, like you and I—is the key to begin turning this whole process around. DR. JILL STEIN: And what we learned, in the course of Bernie’s campaign, is that you cannot have a revolutionary campaign in a counter-revolutionary party. The party pulled out its kill switch against Bernie and sabotaged him. As we saw from the emails revealed, showing the collusion between the Democratic National Committee, Hillary’s campaign, and members of the corporate media. And it wasn’t the first time. This happened to Dennis Kucinich. It happened to Jesse Jackson. They did it even to Howard Dean, creating the ‘Dean Scream’. This is how they work. And it’s been a huge wake-up moment. DR. JILL STEIN: “Well, let me just say that on the day that Bernie endorsed Hillary, the floodgates opened into our campaign. Our fundraising went up about a thousand percent. And that’s, largely, been sustained. “Our Facebook went off the charts. And volunteers poured into our campaigns and actually helped us achieve the ballot access status, that we have now on the ballot in just about 48 states. And this has continued. “This is how they work. And it’s been a huge wake-up moment. “And Bernie’s campaign was very principled in most regards, I think. You know, he certainly didn’t go far enough in questioning the military policy, the military-industrial complex, and so on. But, you know, I think that’s the price you pay for being in the Democratic Party. And Bernie has to pay that price. If he were liberated from the Democratic Party, it might be a whole new ballgame. “You know, as he said himself, it’s a movement, not a man. And that movement continues to move into our campaign. It’s going strong. I think it’s a marriage made in heaven. The Green Party provides the infrastructure, kind of, the culture of watchdogging the electoral bureaucracy and how you participate, how you get on the ballot, stuff like that, which is very difficult to do, unless you have billions of dollars. “Young people are screwed. They don’t have a way to pay off this debt. And when they discover that they could come out and vote Green to cancel that debt, that I am the one candidate, who will bail out the students, like we bailed out the crooks on Wall Street, then it becomes an irresistible motivation to actually come out and vote Green. “And I just want to note that 43 million young people in debt is enough to win a three-way Presidential race. DR. RALPH NADER: “You know, we’re trying to convey how much easier it is than most people think, especially young people, to turn the country around, if they focus on the levers, if they focus on Congress and state legislatures. “If a hundred people in each congressional district started a Congress watchdog club with a letterhead and a summons to the members of Congress to come to town meetings, even just a hundred people out of 690,000 people in each congressional district, they will begin to feel their power and feel how they go to 200, 500, 700, how they can challenge these corporations, that control a majority of the members of Congress, even though they don’t have any vote. We’re the ones that have the vote. “So, we have to convey the sense that in American history it’s always been a few people, that started movements against slavery, women’s right to vote, the farmer-labour revolutions in the late 19th century. And always third parties have been first, Jill Stein, as you say to your own audiences, they have been first with the great issues, way before the two major parties. They were first to recommend a social security program, a medicare program. They were the first to push for a 40 hour week, for progressive taxation. DR. JILL STEIN: “Great. So, go to Jill2016.com or, on social media, go to DrJillStein—and that’s D-R, no period—and join the team, because we’re here for the long haul. “And, you know, in the words of Alice Walker: The biggest way people give up power is by not knowing we have it to start with. We have it, just to look at the power of fighting student debt or 25 million Latinos who’ve learned that the Republicans are the party of hate and fear, but Democrats are the party of deportation and detention. “We have all the numbers we need to turn this system on its head. The anti-slavery parties were also called spoilers, including the Republican party, that went on, not just to abolish slavery, but to, actually, take over the presidency, moving very quickly from third-party into the presidency. “At a time of great social upheaval, all things are possible. We must challenge, as Ralph was saying, you know, to fight at every level, including Congress, and to make that challenge political and to organise as a political party is how we get traction. DR. JILL STEIN: “Don’t let them talk you out of your part. On Dr. Jill Stein’s main opponents, the two dominant, establishment, corporate candidates..
DR. RALPH NADER: “So, that’s your opening statement, if you’re on the presidential debates at Hofstra on September 26th . “He’s cheated about everything and everybody he’s dealt with. He’s cheated against his workers, his consumers, Trump University, that fraud. He’s cheated against his small business suppliers. He’s cheated against his investors with his bankruptcies. He’s cheated against his creditors. He even has boasted about cheating against his matrimony. And he’s cheated against taxpayers, by being a corporate welfare king and not paying any taxes, refuses to disclose his tax returns, which would show all kinds of interrelations, that might lead to his disapproval by people. DR. JILL STEIN: “Well, you know, as Bernie Sanders himself said, you know, the Trump movement reflects the economic despair and misery that’s been inflicted, not only, on the American people, but people around the world, as we have been subject to globalisation and financialisation and austerity and workers have been thrown under the bus, while the 1% is rolling in dough. “You know, the way that you address this right-wing extremism is actually by putting forward a truly progressive agenda. That’s the only solution here. “And the economic misery—who passed NAFTA? You know, Bill Clinton signed that, with Hillary’s support. Who passed Wall Street deregulation, that enabled the meltdown of Wall Street and the disappearance of nine million jobs, the theft of 5 million homes? “You know, we have Democratic centrists here to blame for the economic conditions driving this right-wing extremism. “But let me put this another way. Polls show that a majority of Trump supporters don’t actually support Donald Trump. They actually dislike Hillary Clinton. They’re looking for something else. So, what we need to do is to give them something else. “And in terms of the role of the media, that is my candidacy, which does provide that truly progressive agenda, that gets to the heart of what is driving this right-wing extremism. “It’s not just Donald Trump. Hillary Clinton is not gonna be the solution here. She’s gonna be more of what is driving this incredible economic insecurity and this shift to the right. DR. RALPH NADER: “It’s amazing how the media has degraded itself to the level of the Republican primary—scurrilous back and forth. And, the media—I keep telling people in the mass media: You’ve got a privileged position in the First Amendment. And you should have a higher estimate of your own significance and not just be ditto-heads for political scum and political slander. “And, so, here we are. We have a few weeks left before the election and people have got to rally Hofstra. You want to go and rally Hofstra. A lot of people in the New York City area on September 26, Monday, September 26th, the first Presidential debate. The media is going to all be there. If there are 20, 50, 100 thousand people there, saying, open up the debates for the third parties, I think that will begin getting the attention of the mass media. “So, I urge listeners in the greater New York City area to go to these peaceful rallies, and with your placards. And make your demands known because the press is all there. You go where the press is. DR. JILL STEIN: “Yes, definitely. This is where the American people are. This is what we demand. Over three-quarters of the American people are saying: It’s time to open up the debates. We have rejected these two candidates at the highest levels of disapproval in our history. “What’s wrong with this picture? You know, what’s wrong with this picture is that Americans not only have a right to vote, we have a right to know who we can vote for. It’s time to override this fraud being committed on the American voter of the two-party tyranny, of this private corporation, of the Commission on Presidential Debates. We the voters demand the right to be in charge here, to be informed, to be empowered. “And let me add that, at this moment, we are seeing before our very eyes a political realignment. We’ve seen the Republican Party come apart at the seam with Donald Trump taking the remnants over the cliff. We’ve seen the basic foundation of the Republican Party move into the Democratic Party inside of Hillary’s campaign. “And you have endorsements, everyone from Meg Whitman to the neocon John Negroponte and others, who are all saying, you know: We’re with Hillary now. So, we’ve got a big happy, one corporate family now uniting the corporate Democrats and the corporate Republicans. The people of integrity inside the Bernie campaign have split off and are unifying with the Greens. DR. RALPH NADER: “As I was saying, half a democracy is showing up and people have got, not only, to agree with this agenda, some of these third party listeners, they’ve got to show up. People have got to show up, showing up at meetings, rallies, marches, city council, courtrooms. You’ve got to show up. “We have a Democratic Party, that cannot defend the American people from the worst Republican Party in history because it’s a Democratic Party of war and Wall Street. And we have two parties, who are basically hijacking our country for their corporate paymasters. “And, if we focus on 535 members of Congress—that’s not all that many—we’re going to see a fast turnaround. So, focus all your concerns, all the information, the kind of agenda the Green Party has, turn it right on your Senators and Representatives. DR. JILL STEIN: “Great. So, Ajamu Baraka is a human rights advocate and an international human rights advocate, who’s been defending racial justice, economic justice, worker justice, indigenous justice, and justice for black and brown people all over the world, and, in the United States, has been helping to lead the charge against the death penalty here, and is an extremely eloquent and empowering person. And one of the great things about running with him is that we speak to all of America. “He comes out of the tradition of the African-American intellectuals, the people who’ve really been standing up for African-American rights and economic rights and workers rights. And, because he speaks in the language of his community, and makes no bones about it, he really invites in a whole new demographic of voters who have been locked out—African-American and black and brown people and indigenous people—who have felt like this system has no place for them. And he is unapologetic about standing up for the rights of the oppressed people and against colonialism and against imperialism. And he’s very inspirational. DR. JILL STEIN: “Okay. So, again, the website is Jill2016.com. That’s Jill2016.com. And our social media is DrJillStein and that’s D-R, no period, D-R-Jill-Stein, all one word. And you can see our media appearances as well as connect to our Power to the People agenda, our Green New Deal, our plan to abolish student debt, and our plan to, actually, create a whole new foreign policy based on international law and human rights. “That means we don’t supply $100 billion dollars worth of weapons to the war criminals in Saudi Arabia, nor do we supply $8 million dollars a day to the Israeli army, that is also violating international law and human rights. So, there are real solutions right now for us. If we stand up with the courage of our convictions, there is no stopping us. “So, join the team. Come out to Hofstra, again, on September 26 . And let’s begin to take our democracy back. We are in the target hairs in this election. We are all asking whether we are going to have a world at all or not going forward. DR. JILL STEIN: I had a taped interview [with Judy Woodruff of PBS], which was approximately six or seven minutes long. And it was actually posted—I think it was live-streamed, in fact—on Facebook. And, then, it was played on the News Hour that night. And some of our astute watchdog supporters compared the two. And they discovered that some of my most important statements critiquing Hillary Clinton […] was cut out, and also my discussion about the Trans-Pacific Partnership […]. DR. JILL STEIN: “That’s right. I had a taped interview which was approximately six or seven minutes long. And it was actually posted—I think it was live-streamed, in fact—on Facebook. And, then, it was played on the News Hour that night. “And some of our astute watchdog supporters compared the two. And they discovered that some of my most important statements critiquing Hillary Clinton and why she is not going to save our hides, whether it was her war policy or for shipping our jobs overseas with NAFTA, her history of dismantling the social safety net and supporting the destruction of aid to families with dependent children, putting millions more children and families in poverty. You know, I told some hard truths about Hillary Clinton and why the lesser evil is not okay, that, apparently, my discussion of Hillary Clinton was cut out and also my discussion about the Trans-Pacific Partnership, and why it is an absolute betrayal of our democratic sovereignty and why it must be stopped, and why anybody supporting the Trans-Pacific Partnership is, essentially, betraying the basic principles of democracy. DR. RALPH NADER: “What’s interesting is this election year has made the citizen groups off-limits. All these citizen groups—local, state, national—that really do things and improve the country, they’re never asked to be in these electoral campaign discussions. It’s all these pundits, all these consultants, and the candidates, as if they’re in a bubble leaving democracy off-limits. DR. JILL STEIN: “Oh, absolutely. And, you know, we’re not out holding fundraisers in the Hamptons or in Beverly Hills. My running mate, Ajamu Baraka, was out camping out with the homeless in Baltimore last night. We were both recently at the Standing Rock Sioux encampment, where, in fact, we are both now, a warrant is out for our arrest for participating in civil disobedience to support this very critical stand being taken on behalf of our water, on behalf of human rights, on behalf of our climate. “We were out there with the people, whose homes were flooded out in Southern Louisiana. We are out there on the front line with everyday people fighting the real frontline battle, that real Americans are fighting. “And let me support what you just said, Ralph, about everyday Americans really having the power here. People may remember, or you may have heard, if you weren’t there during the Nixon years, we had one of the worst presidents ever on record. But, we, the American people, have the sense of our own power. We were in the driver’s seat. We forced Richard Nixon and the Congress who established—and thanks to your leadership, Ralph. We supported you; and we got the Environmental Protection Act and Agency. We ended the war in Vietnam, and brought the troops home. We got OSHA established with your leadership. We got the Supreme Court. We pressured the Supreme Court into supporting a woman’s right to choose. “So, there should be just no end to what we can do when we operate with the courage of our convictions and we get out there in the street, in the voting booth, we assert our power and we take our democracy back. “And I’m getting the sign now from my campaign, that we are about to run into our next event here at the University of Maine in Orono. So, I will have to bid you adieu. But it has been really wonderful and inspiring as always talking with you, Ralph, and you. Steve and I just so greatly appreciate, in fact, I give you credit or perhaps the blame for my candidacy. On Dr. Ralph Nader’s professional title: Dr. Nader holds a Bachelor of Arts from Princeton (1955) and an LL.B., or Bachelor of Laws, from Harvard University (1958), which is equivalent to a J.D., or Juris Doctor professional doctorate. Yale graduates who received LL.B. degrees prior to 1971 were similarly permitted to change their degree to a J.D., although many did not take the option, retaining their LL.B. degrees. 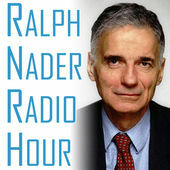 Terrestrial radio transmission, 94.1 FM (KPFA, Berkeley, CA) with online simulcast and digital archiving: The Ralph Nader Radio Hour, this one-hour broadcast hosted by Ralph Nader, Monday, 19 SEP 2016, 11:00 PDT. Fund Drive Special, Tuesday, 20 SEP 2016, 19:00 PDT. I got through transcribing a portion of this transcript, which is no small task, when I realised that the combination of Dr. Ralph Nader interviewing Dr. Jill Stein about her 2016 presidential campaign might just be popular enough to have inspired some other kindhearted soul out there to have transcribed at least some of this broadcast. And, lo and behold, William Brighenti, the “Barefoot Accountant”, has done us all a great service by roughly transcribing this historic broadcast (or having it transcribed). This gave us at Lumpenproletariat a great boost in our transcription process. But we still went through the entire broadcast and cleaned up and edited and verified the transcription as per our usual transcription style, including enriched text with embedded links to aid in learning, comprehension, and to encourage deeper analysis and study of the content. Even KPFA’s Mitch Jeserich on Letters and Politics seemed to reduce, or truncate, Dr. Stein’s responses to mere soundbites, such as, for example, on 18 AUG 2016. On this point of public works programmes and the goal of full employment, not to mention the Fight For 15 activism, of which Dr. Ralph Nader spoke, which drove many people to Bernie Sanders’ campaign, it’s important to point out that two of your author’s former UMKC economics professors actually went on the campaign trail with Bernie Sanders: Dr. Stephanie Kelton and Dr. William K. Black. Dr. Kelton was then Chair of the Economics Department at the University of Missouri-Kansas City (UMKC), one of the few heterodox economics departments in the United States, when your author took lectures (circa 2014) on intermediate macroeconomic analysis with Dr. Stephanie Kelton (as well as auditing some of her graduate level lectures). Dr. Kelton went on to be hired by Senator Bernie Sanders to work as Chief Economist in the Senate Minority Budget Committee. Then, when Sanders ran for the Democratic Party nomination for the U.S. Presidency, Dr. Kelton continued on as a chief economist in Bernie Sanders primary campaign. Dr. William K. Black also joined the Sanders campaign team, providing his expertise in law and economics. Dr. Stephanie Kelton, Dr. William K. Black, and then-econ-undergrad Messina. Most Fridays, our UMKC Econ Club featured economics seminars, which often invited economists from around the world to speak at UMKC. Then we would often have dinner gatherings afterwards, such as this one. This was all very exciting for us coming out of UMKC and the world of heterodox economics because of the radical policy proposals UMKC economics has been proposing for years, including modern monetary theory (MMT, or modern money theory) and the Job Guarantee Programme (or ELR programme, Employer of Last Resort). We hear a lot of talk across the political spectrum about the need for jobs and to combat poverty. Yet, amazingly, somehow, perhaps due to cowardice, Bernie Sanders never once—as far as we know—mentioned MMT or the Job Guarantee programme. Basically, Sanders could have gone on the campaign trail and promoted the Job Guarantee programme, which can literally end involuntary unemployment immediately. Then, Sanders could have easily defeated Hillary Clinton in the primary. Even without including MMT and the Job Guarantee programme, Sanders could have contested Hillary Clinton’s primary election violations. But Sanders seems to have sold out, or have been intimidated into conceding to Hillary Clinton, because after Sanders was called into the principal’s office and sat down behind closed doors with President Obama, he shifted gears to conceding to Hillary Clinton and endorsing her without qualification. That doesn’t even make sense, unless he was seriously compromised in some way, either through fear or intimidation. And, now, Dr. Jill Stein has continued on the campaign trail and talking about jobs. But it’s a shame that, somehow, the world remains in the dark about MMT and the fact that we could literally end involuntary unemployment today. I’ve also emailed various programmers at KPFA about this. But none of them have responded. Actually, Mitch Jeserich replied once, but only to say that he didn’t know much about macroeconomics, but that he would ‘look into it’. It’s somewhat ironic, now, that Politico.com has published their list of 50 most influential people with Bernie Sanders in the #1 spot and Dr. Stephanie Kelton in the #44 spot. I guess it doesn’t reflect negatively on Dr. Kelton that Bernie Sanders refused to inform the American people about MMT or how sovereign monetary systems work or how the USA’s sovereign monetary system means the state can afford to spend without fiscal constraints. The only constraints are real resource constraints. Modern money theory (MMT), as taught at heterodox economics departments, such as at the University of Missouri-Kansas City (UMKC), proves that the USA’s state monetary system can afford to spend for public purpose because it is the sovereign currency issuer of its own currency, namely the US dollar. Also, the fact that the US dollar is a major international reserve currency further buttresses the USA’s monetary sovereignty. Essentially, the USA can afford to spend without fiscal constraints. The only government spending constraints are real resource constraints, as Dr. Kelton often says. Point of information: CNN hosted a 2016 Presidential Town Hall Featuring the Green Party’s presidential candidate Dr. Jill Stein and vice presidential candidate Ajamu Baraka. Most economists agree that the next economic bubble to burst and devastate the American economy is the looming student debt bubble. (c. 50:02) Mitch Jeserich and/or Quincy McCoy cut back to the section, which they previously cut out above. This time, skipping the critique of Hillary Clinton and the Democratic Party and jumping to a safe and tepid question by co-host Steve Skrovan about identifying Dr. Jill Stein’s vice presidential running mate. Ajamu Baraka.